Renting a small room in an insalubrious neighbourhood is a rite of passage for most young people new to a big city. And generally speaking, the rule of a rite of passage is that it promises something better once you've got through the bad bit – in this case, a nice house after the squalid one. But for many Londoners renting today, that rite increasingly has no discernible end – it only delivers you to another windowless room in another overpriced, over-populated houseshare balancing on the tightrope between zones two and three. On paper then, the offer of a small bedroom in an apartment block near Willesden Junction, sharing with another 550 people for the sum of £1,083 a month might just sound like the unfunniest joke you've ever heard. But that is what property company The Collective is offering with its purpose-built new development, Old Oak – except, of course, it's a whole lot more than that. 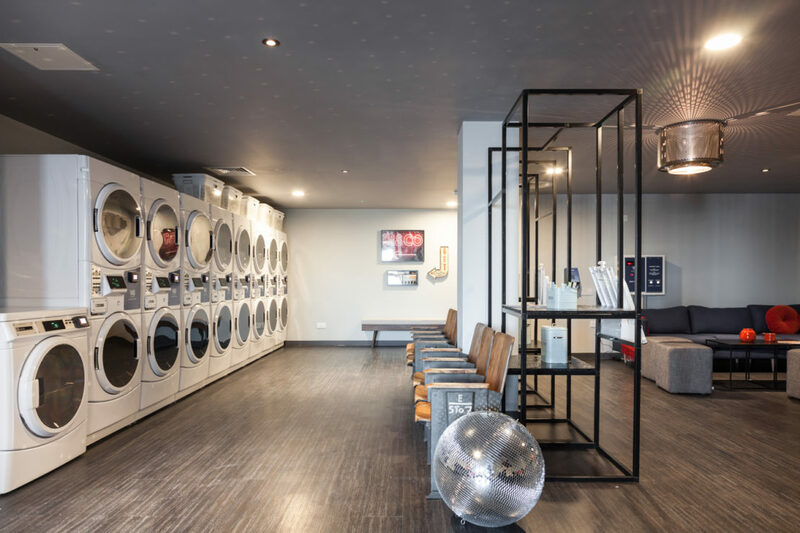 Marketed as a "new way to live in London", The Collective Old Oak claims to have been "designed for those who want to make the most of London life". You might think it ironic that it is situated in NW10, a place of note mainly for housing Wormwood Scrubs. But ignoring the location for a minute, what Old Oak provides is not just a room, but a ready-made community of people at a similar point in their lives (youngish, single) with all the boring bits – the bills, the council tax, the cleaning – taken care of. Old Oak is made up of studios or 'twodios' – two compact (read tiny) rooms with a shared kitchenette – with communal living spaces in the form of themed dining rooms, a library, cinema, rooftop, bars, restaurant, spa and gym. 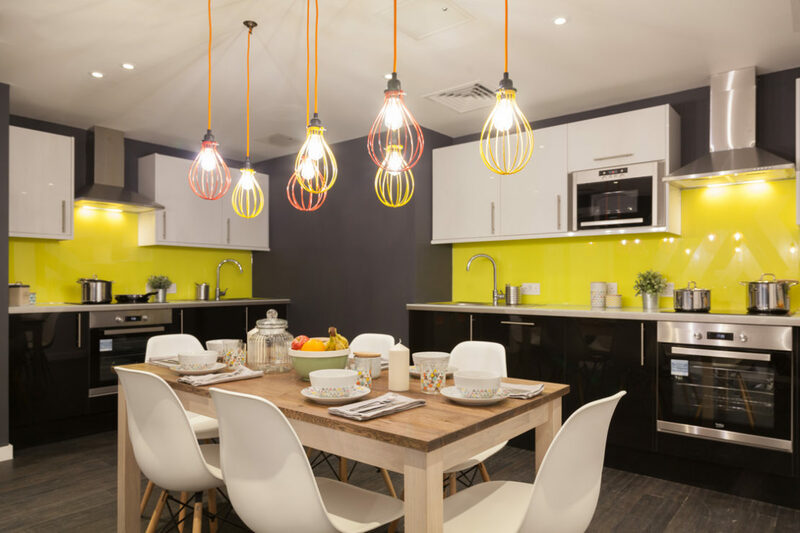 Think serviced apartments meets luxury student halls – although the dorm comparison is one The Collective roundly rejects. "We don't use the S-word here", says Stephanie Cornell, Old Oak's Head of Communications, as she shows me around the newly opened but not-quite-finished building. At the time of my visit in May, there are 60 inhabitants; but come the end of June all 550 rooms will be full. 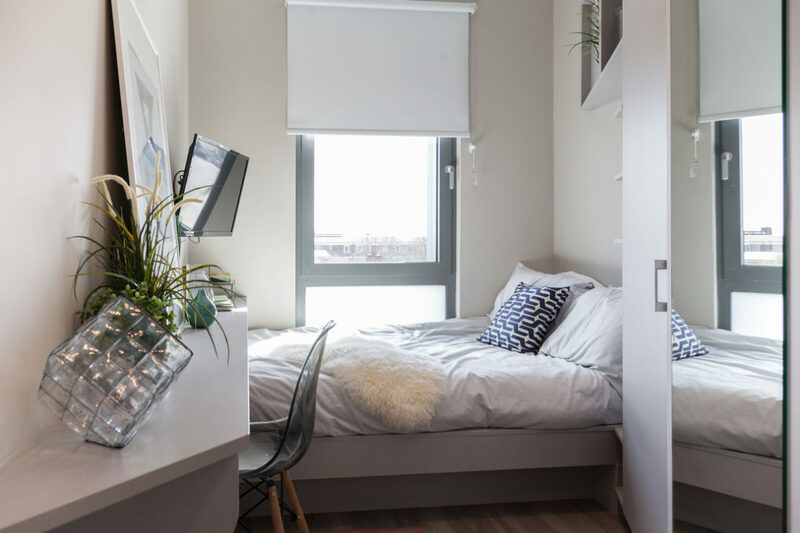 "It's natural that people will always draw parallels, because we're trying to take the best from student accommodation – that sense of community and belonging – but massively upgrading it. It can be frustrating that we're trying so hard to create this product, but people are confused by it because they don't know what it is." Really, what that £1,083 a month buys you isn't just a place to live, but a lifestyle. And that lifestyle has a name – co-living. 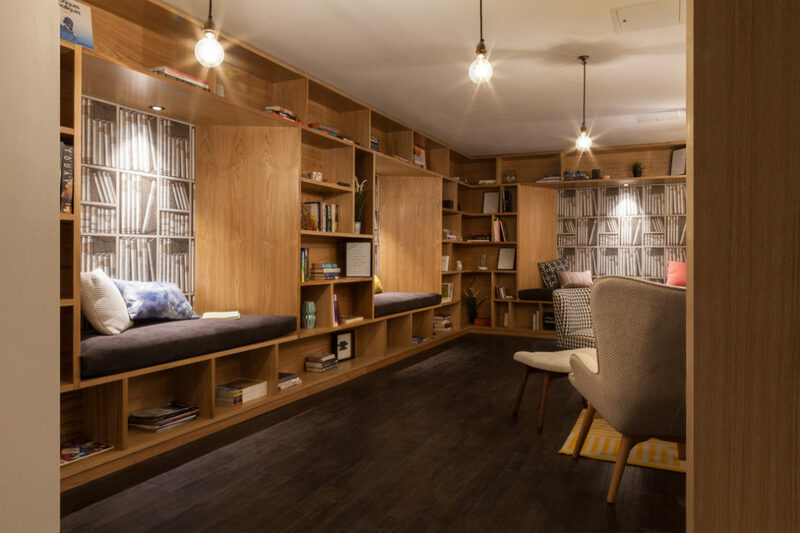 Rather than likening it to student accommodation, Cornell thinks the idea behind co-living bears a closer resemblance to co-working. Both have that same startup, social mentality at their core. It makes sense then, that WeWork, the co-working company recently valued at $16bn, has now launched WeLive: "A new way of living based on community." While Old Oak is the largest co-living building in the world, the US is still way ahead. Pure House, Common and Open Door are just three American co-living companies founded in the last five years that are thriving. 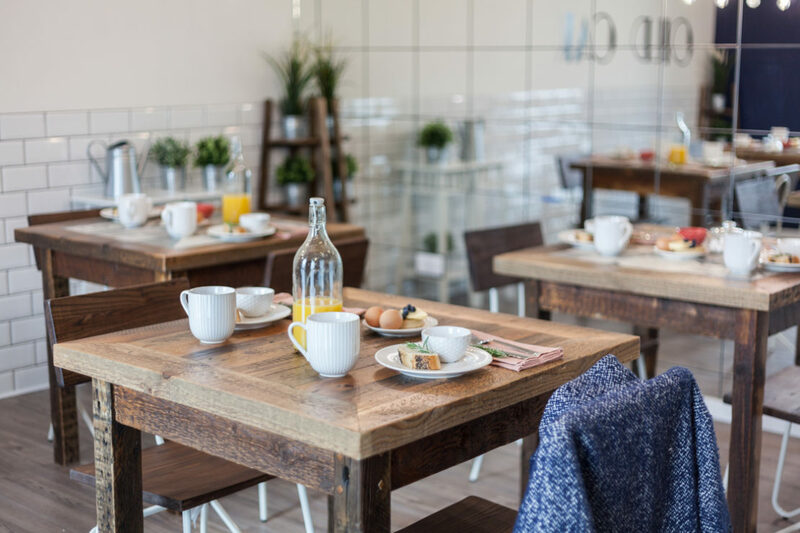 Co-living might sound like a dressed-up version of the houseshare, but there are crucial differences – namely that you actually, actively want to be living with other people. "We don't want to be selective or prescriptive when we're accepting people to come and live here," says Cornell. "But if you don't buy into co-living, it's just not going to work." While it's not mandatory that you have to constantly socialise with other members (another co-living difference: you are a 'member', never a tenant), it is certainly encouraged. Community managers arrange events ranging from educational talks to film nights, although Cornell is keen to point out that it's not about organised fun: "The community managers very much want to be in the background, eventually empowering people to do their own events and take charge of themselves," she says. That's why they're developing an app to help members better connect. There's no pretending that Old Oak is cheap. But the idea that co-living might actually be desirable, rather than something forced upon us by London's bloated renting economy and our stagnating wages, is one that can be easily overlooked in conversations about the housing crisis and what the future holds for Generation Rent. Indeed, if you're able to afford to spend over a £1,000 on rent, it might be that you can also afford to live somewhere more conventional. When the average rent for a one bed flat in London has now exceeded the £1,200 mark – with the typical Londoner handing over more than half of their monthly salary to their landlord – the package becomes, if not exactly agreeable, then at least not shocking either. Tracy, a 30-year-old civil servant, chose to move into Old Oak as her last rental "didn't feel like a home". "I was living in Camden, in a houseshare put together by a dodgy landlord," she says. "The share was amicable but none of the personalities worked together. I liked all of the additional facilities like the spa and gym Old Oak offers. I also liked the fact that there's lots of opportunity to meet new people. Co-living for me means you get a lot more for your money, and I also love the sense of community." Community is the word that comes up again and again in conversations about co-living. While it's true that co-living companies want to bring people together, their view of what community is is pretty singular. It's hard to ignore how companies such as The Collective and Commune have appropriated 20th-century utopian ideas of communal living – as their names attest – and rebranded them in an explicitly capitalist model. Co-living is a community of convenience, one that is perfectly packaged. And that has a price tag. In a small office in south west London, I meet Jessica Rees, who runs the marketing team for Capital Living. Founded in 2010, Capital Living now has 40 properties across south west London, each housing between four and eight people across a broad age range. Like Old Oak, its goal is to take out the hassle of shared living so that members can focus on enjoying the city – and each other. "For us it's all about the people," Rees says. "It's almost a bonus that the houses are beautiful and in decent areas. That's the way we see it." Not anyone can move into a Capital Living house – you have to be in full-time employment, preferably working a nine-to-five. "We're trying to create an environment where ambitious individuals can achieve their goals," she says. That means members don't have to think about cleaning, or finding a new housemate when one moves out. If there's a problem, of any sort, Rees and the team are there to fix it. "Everyone's grown up and ideally they'll sort out [any problems], but we are here if they can't do it themselves," says Rees. "We're here to hear both sides and offer advice." These are landlords with hearts – not forgetting, of course, that they're still taking £1,035 a month from your wallet for that privilege. Moreover, Capital Living members – the majority of whom work in the finance sector and earn six-figure salaries – could definitely afford to live alone. Why then, does Rees think they choose to share their living space with others? "There are a lot of people who have been living in London for years, but their friends are at that stage where they're moving in with other halves and you're not ready or not with anyone," she says. "Some of our members just want to meet new people and are happy to put themselves out there." By 2025, the majority of those living in London – 60 per cent – will be renting (a reversal of the picture in 2000, when 60 per cent of Londoners owned a house, either outright or with a mortgage). Just 26 per cent of 20 to 39-year-olds will have a mortgage or own a home. And when the average rent now exceeds £1,500, not to mention fees and unreliable landlords, co-living offers an alternative for those who have the cash. "When we talk about the concept of Capital Living and get a bit deeper with it, people are just blown away," says Rees. "They're like, 'How have I not heard of it before? How are other people not doing it?' And I'm sure that they will." Olivia Marks is a journalist writing about women, culture, lifestyle and social trends for a number of publications. She lives in London.